Unsere modernen 2-Zimmer, 1 Badezimmer Haus der ideale Ausgangspunkt für Leute besuchen Glacier National Park, Whitefish und der Flathead Valley. Das Haus hat eine reizvolle, offene Grundriss in den Wohnbereich. Das geräumige Schlafzimmer verfügt über ein Glas-Schiebe-Tür zum eingezäunten Garten. Das zweite Schlafzimmer ist hell und sonnig. Für Outdoor-Fans, wir sind in der perfekten Lage. Das Messer am Ufer Park ist nur wenige Minuten entfernt - Wanderwege und Fluss-Zugang für Bewegung, Entspannung, innere Schlauch, Rafting oder Angeln. Wir sind zu Fuß zu allen der Innenstadt von Columbia Falls - Montana Kaffee Händler, Three Forks Grill, Smith's Gemischtwarenladen, Perfect Cuts Metzgerei, North Fork Pizza, Back Slope Brewing. Sie können vor Ort für das Abendessen einkaufen, kochen in unserer gut ausgestatteten Küche und essen bei uns im grünen Garten. Der Hof ist sonnig, sehr schön gestaltet mit alten Bäumen und Büschen und hat eine Feuerstelle. Sein 10 Meilen in die Stadt Whitefish und 20 Minuten zum Glacier National Park ermöglicht den schnellen Zugriff auf alles, was Sie in der Flathead Valley machen wollen. Die Columbia Falls Radweg ist direkt vor der Haustür. Es ist an der Straße Parkplätze und eine Waschmaschine und Trockner. Badewannen- / Duschkombination. Große Wasserdruck und die hohe Kapazität Warmwasserheizung. Die Toilette ist neu, mit länglichen Schale, Dual-Flush-System (geringeres Volumen für flüssige Abfälle, höhere Volumen für feste Abfälle) und ruhig-Deckel schließen. We had a wonderful time. The house was clean and cozy, just what we were looking for. The kids loved running in the yard (and cleaning up apples). The owners left a good book of info, some yummy home-grown veggies, and a cooler to sweeten the deal. We never figured out how to get to the River’s Edge Park mentioned in the listing, but mostly that was because we were too busy exploring the rest of the neighborhood and surrounding area. We will definitely consider it again. Everything is there. Clean and very easy to get in touch with owners. Neighborhood and area are not upscale nor is the house. One bathroom must challenge different friends but location is excellent. Price could better reflect this. House is updated and yard is private enough. Would recommend it to friends. This house was a perfect place for our GNP "base camp." It was very clean and had a nice kitchen and excellent private back yard. Loved our stay in Columbia Falls. Really enjoyed our stay in this nice house which was the perfect size for two, and centrally located between Glacier National Park, Whitefish, and Kalispell. Even though the house does not have AC, and temps this week were in the upper 80's, the house remained relatively cool by keeping the curtains closed and using the ceiling fans. The kitchen was fully stocked and I appreciated the selection of common spices as we cooked several meals at home. We enjoyed using the gas grill and eating dinner in the backyard. River's Edge park is a quick walk away, and we enjoyed evening strolls there. We also spent time hiking in Logan Pass and Many Glacier in GNP, and loved the beautiful views. Even though the beargrass was mostly gone, many other wildflowers were in full bloom and beautiful. We also explored Whitefish and found interesting shops and good restaurants. We particularly enjoyed the Three Forks Grille in Columbia Falls for dinner, Montana Coffee in Columbia Falls for breakfast, and Loula's in Whitefish for lunch and huckleberry / cherry pie. This is a cute 2 bedroom house with lots of room for 4 people. The Kitchen had lots of counter space and everything you need plus many extras. Washer and dryer so handy for hiking in the dust and mud. There were many hooks on walls to hang all your jackets and clothes. 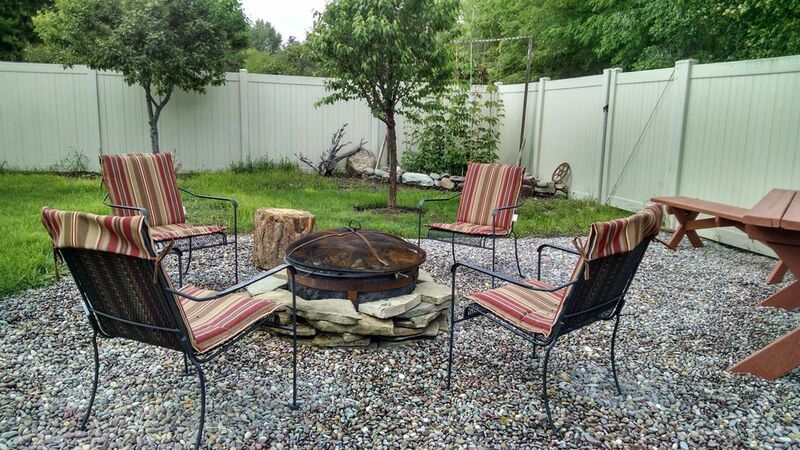 There is outdoor space to use in back yard. The owners even left us a cooler to use while here. So many extras and considerate ways the owners made us feel welcome. Great place!!! We loved our stay here. It was convenient to Glacier National Park, some good places to eat dinner and was a clean, relaxing place to unwind after some hiking and sightseeing in the park. West Glacier ist 20 Minuten entfernt - eine große Drehscheibe für geführte Angeltouren, Helikoptertouren und Wildwasser-Rafting. Flathead National Forest ist leicht zugänglich. Whitefish Mountain Resort verfügt über eine Vielzahl von Aktivitäten im Sommer wie Mountainbike Downhill, Zip Line-Touren und einem Luftabenteuerpark. If the date you are seeking is not available, please contact us. Check in time: 4 pm Check out time: 10 am; fees may apply if property is not vacated on time and/or late check out has not been approved.